The Arabic word (Halal) means lawful or permitted. In the Holy Qu’ran, Allah commands Muslims and all of mankind to eat of the Halal things. Basically, Allah Al Mighty knows what is best for us to eat. And normally all the halal food are very clean and safe from any disease. Unlike non-halal which you can always find some interesting facts relating to sickness. The opposite of Halal is Haram, which means unlawful or prohibited. Halal and Haram are in fact universal terms that apply to all facets of life. As far as food is concerned, the Qur’an makes it clear as to what is Halal and Haram. 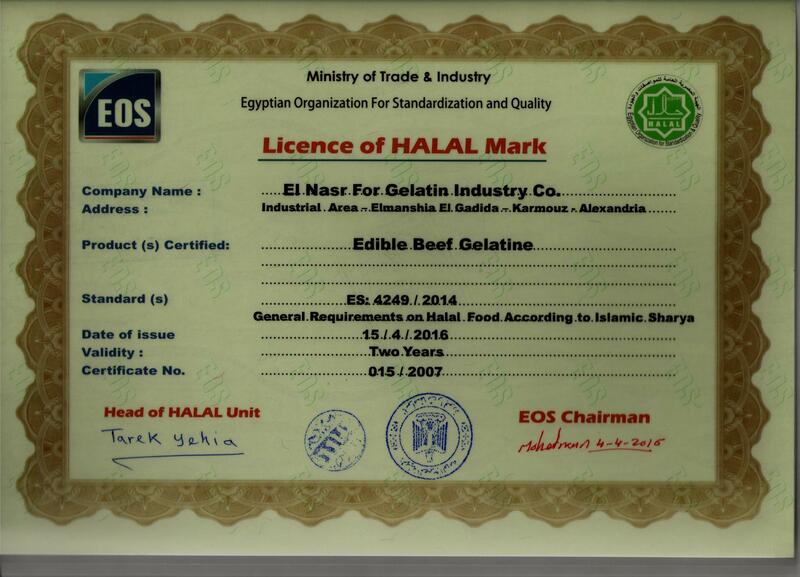 The company holds a license to put Halal mark on its production and that is according to the halal Egyptian standard 4249\2008, and this standard make sure that the company’s production of gelatin is permitted halal food according to Islamic sharia law, and it does not include any components that is not consistent with sharia law. This standard make sure that the production is using components from animal origin , and it does not include pigs, dogs, snakes, carnivores animals with claws , prey birds, insecticides animals or animals prohibited to kill it in Islamic sharia law. This food subject to periodic inspection by the officials of the mark, included AlAzhar Alsharif representative , technicians of general authority for standard specifications to make sure of the availability and application of this mark. 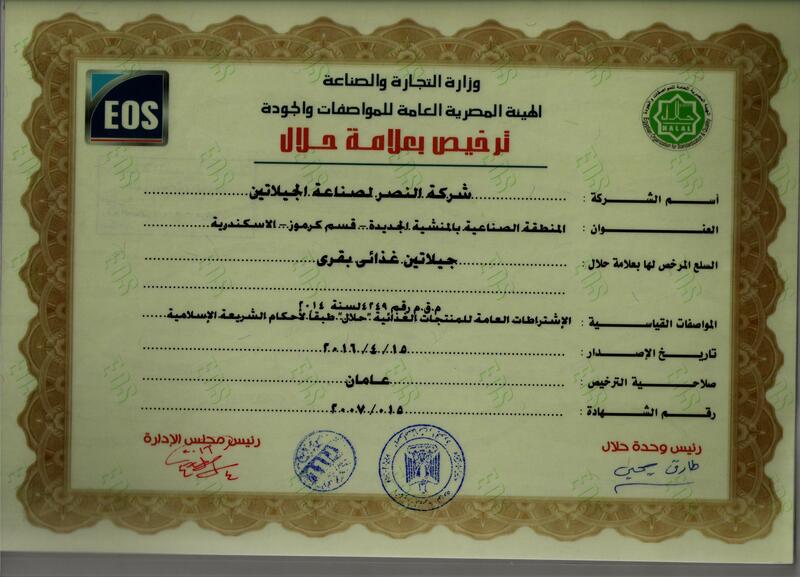 Also , The factory located in Islamic country, owned muslim. All the workers in management and operational site also 100% Muslims, the hides are from animals, slaughtered ONLY by Muslims according to Islamic law/syariah, we only produce halal so mixing dose not occurs. 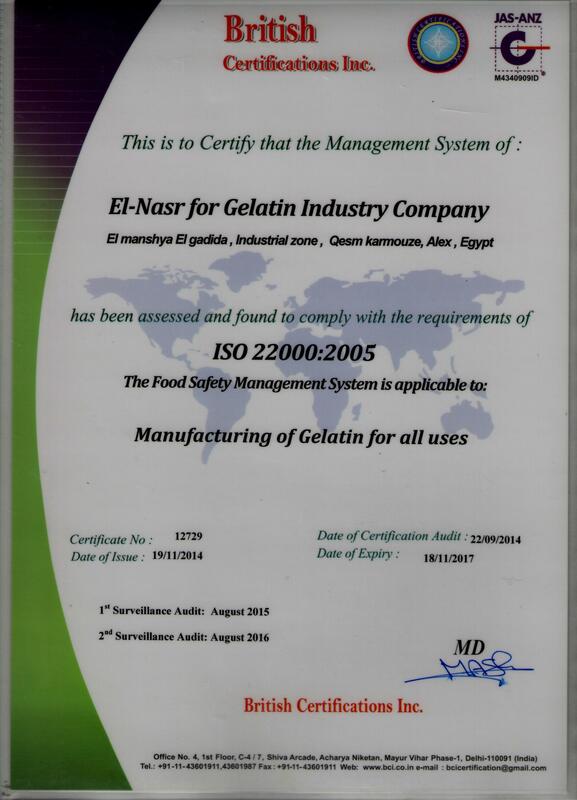 The company holds ISO 22000\2005 , OHSAS 18001\2007 which confirms that the company is commitment with health requirement needed for safety of production and validity for human consumption . 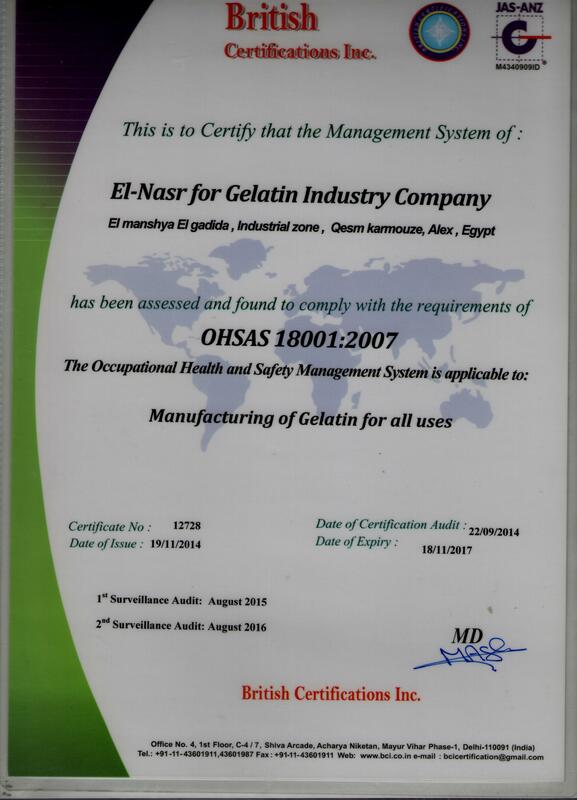 The company has chemical, physical and microbiological laboratories , all daily production samples are analyzed on it to make sure that the product specification is in consistent with Egyptian standard specification and to guarantee the validity of human consumption. Periodical analyses is done in engineering collage laboratories as it is specialized laboratories to make periodical analysis to make sure of product safety and consistence with standards.